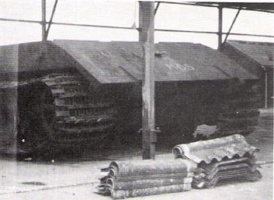 The E 100 is a German tier 10 heavy tank. The last tank of the Entwicklung series, the E-100 is a fearsome opponent on the battlefield. While it is not a Maus by any stretch of the imagination, this tank does share a similar play-style with it while maintaining a bit more flexibility over it's colossal counterpart. 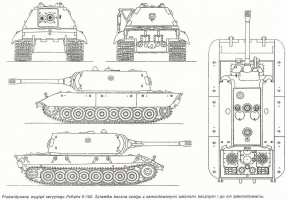 The massive armor of the E-100 is comparable but not identical to that of the Maus. While boasting excellent thickness on all sides, it is significantly more vulnerable to incoming fire due to several large weak spots. First and foremost, the lower glacis plate is enormous and wide, making angling this tank an absolute must. However, even when angled properly, the lower plate is still susceptible to penetration and will succumb to a surprising amount of unblocked damage. 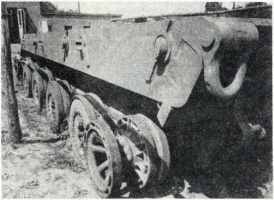 Despite this, the E-100 enjoys a much better angled side armor with spaced skirts which can deflect shots with far greater efficiency than the flat side armor of the Maus. The turret on the E-100 is very tall and only slightly angled making it an easy target. Though it sports very thick frontal armor, the inadequate sloping will permit several well placed shots to punch through. In addition, the significantly large turret ring and the top bar are also prevalent weak points. Angling your armor is, once again, a must. 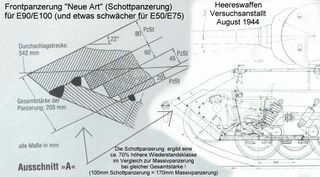 The starting main gun of the E-100 is the same 12,8cm gun which is used by the Maus, but the E-100 has the option of upgrading to the 15cm KwK L/38 cannon which trades the default gun's accuracy and rate of fire for a significantly increased alpha damage output. The long reload of both guns means that your defensive game needs to be strong due to your main role being that of a close to medium range brawler and, as such, will require effective usage of your armor. In addition, you will absolutely require your teammates aid when engaging multiple vehicles, because should your enemy decide to press your flanks, there's little that can be done to protect yourself from being encircled and mercilessly slaughtered. And although the E-100 does boast improved speed and maneuverability, artillery will still have a field day with you if you are not privy to your surroundings and your cover. 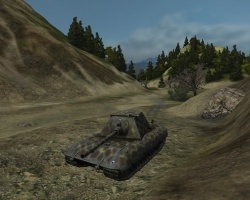 Overall, the E-100 should be played much more aggressively than the Maus due to it's many marked differences and should not only act as a shield for its more vulnerable teammates but as a dealer of significant damage in return. Basically, the player is advised to take the hits but to return them in kind as well. Play this tank to it's strengths and the enemy team will have a very hard time stopping your advance as you confidently lead the assault to break through their defenses and head forth to victory. 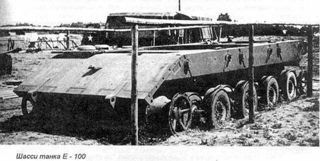 The E 100 marks the end of its German heavy line. 15cm gun has mediocre accuracy; this limits effective use to close-quarters fighting. 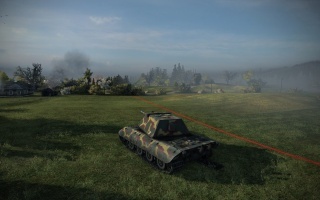 While boasting the same gun as the E-75 in one configuration, the E-100 has the option of mounting the 15cm KwK 44 L/38 with very high alpha damage at 750/750/950. Penetration at 246 mm with AP rounds is slightly not on par with other Tier X Heavy Tanks, however, armed with HEAT ammunition, this tank easily becomes one of the most immediate threats to your health around, if your willing to spend the credits. This tank is "expensive" like the T-54, you can easily compensate for your terrible penetration by pressing your 2 key but theres a good chance you'll be losing money instead of earning. However keeping this in mind, the normal rounds are more then enough if aimed properly. The entire lower front plate is a huge weakness on the E 100, as even tier 8 guns can penetrate it (though a little angling quickly resolves this). Combined with the front-mounted transmission, you are at high risk for engine damage, so a fire extinguisher is a must. 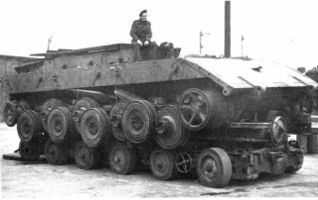 It is the one of two tier X heavies to mount a gun that can do an average of 750 damage per shell, on par with 15cm Tank Destroyers. 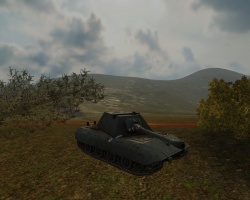 During the long reload time, it's advised that the player angles the turret by about 25° which will make the effective armor of the turret as thick as 300 mm on both front and on the exposed side of the turret. Your turret ring is still vulnerable, however, and when angling the hull, there is a small weak point on either sides of the tracks. 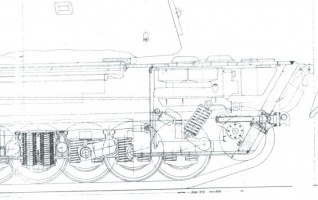 Although moving the tank back and forward quickly while angling the hull at 45 degrees and the turret at 25 makes the turret ring, lower plate and the side of the tracks harder to hit. It also helps if you "wiggle" both the hull and the turret left and right as well as the angeling and moving back and forward. It might be tricky at first but once you get the hang of it, you will annoy the enemy as they will get sick of their commanders yelling "ricochet!" Unlike most tier 10 tanks the E-100 does not come elite. Here you have a choice, you can stay with the 12.8cm gun from the E-75 or grind xp for the 15cm for the extra alpha damage. 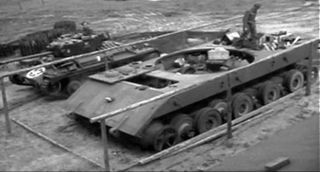 Maus II turret as compared to the initial Maus turret. This turret was presented in World of Tanks as E-100's turret. 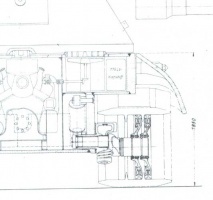 The planned armor specifications of the E-100 turret is actually 200/80/150 (currently 250/150/150). One of its historical turrets, the Mausturm, is missing. This page was last modified on 27 March 2019, at 10:33. This page has been accessed 77,813 times.